Did you know you can make brownies without an oven? That’s right! You can make brownies in a waffle maker. Below I’ll show you how to plug in your waffle maker, whip up our brownie batter, and you will be eating warm brownies in no time! Brownies are a classic American dessert (read about the history of brownies here!) so they are clearly a necessity in every household. But many people don’t have an oven, and even if you do, brownies can take a long time to make. First you have to make the batter, then you have to pre heat the oven and then you still have to wait another 30 minutes while the brownies bake- so annoying! So let’s skip some of those steps and go from batter to brownies in under 5 minutes. Waffle makers are quick to heat up (most only taking around 5 minutes) and the waffle iron plates get very hot. I don’t know about you, but my oven takes a lot longer than 5 minutes to pre-heat. When the brownie batter comes in contact with the hot waffle iron, it instantly cooks. If you were to bake in an oven, the brownie batter slowly heats up while you wait…wait…wait. And when I’m craving brownies, I want them right now! Making brownie batter for your waffle maker will only take a few minutes. 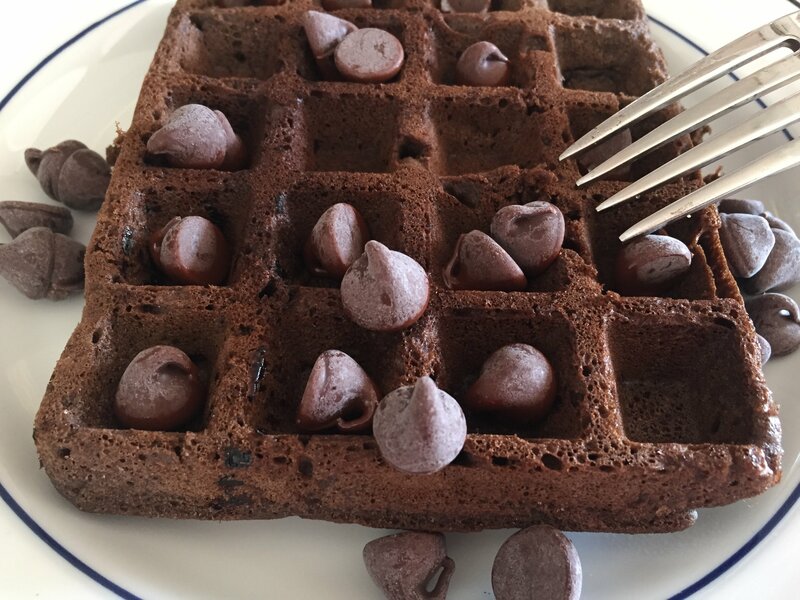 While you can definitely use a box mix to make brownie batter, we have a fantastic recipe (below) that we have customized for the waffle maker. Even the most novice baker will be able to follow our waffle iron brownie recipe below! The dry ingredients are whisked together and the wet ingredients are then added in. A few stirs and the batter is done! Heat up that waffle maker and we are ready to go! Once the waffle iron is preheated (check out the Krups 4 Slice Waffle Maker that beeps when it is ready! ), you are ready to bake. 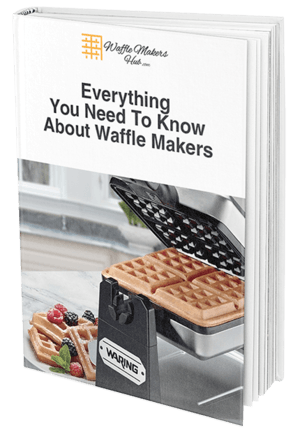 If you have a waffle maker with a non-stick coating (the Oster DuraCeramic Flip Waffle Maker works great for this recipe! ), then there is no need to grease the waffle iron plates, simply pour the batter right in! These brownies are definitely a dessert but with that classic waffle shape, you may be able to get away with eating these for breakfast (why do we eat dessert last anyway? Find out here!). Your kids will love them as a special birthday breakfast treat for sure! They will also be great with a scoop some vanilla ice cream on top. However and whenever you serve these brownie waffles, your chocolate craving will be satisfied! Quick, easy and oh so delicious, brownies in a waffle maker is an amazing dessert discovery! In a medium sized bowl, whisk together the dry ingredients. Whisk in the egg, oil and vanilla. The batter will be fairly thick. Pour the batter into a pre heated waffle maker, close the machine and let the waffle cook (about 3-4 minutes). Remove from the waffle maker and serve while hot with extra chocolate chips, powdered sugar or chocolate sauce! Conclusion: I hope you enjoy my recipe and making these brownies in a waffle maker! If you don’t have time to try the recipe, I totally understand, but that shouldn’t stop you from making a warm dessert for your friends or family.